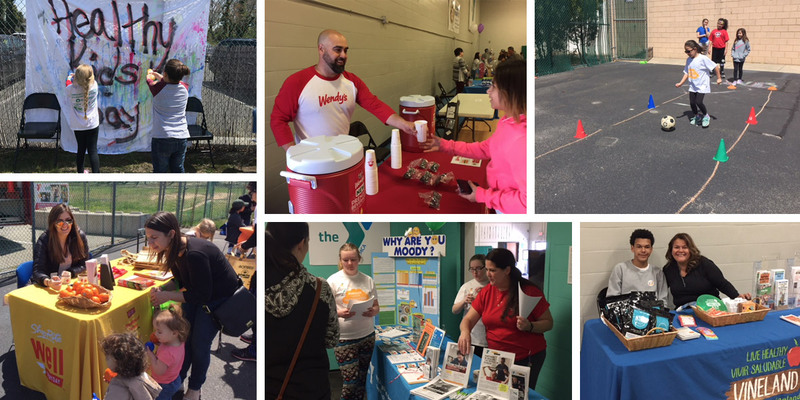 On Saturday, April 21st, the YMCA of Vineland participated along with other Y’s across the country in Healthy Kids Day. This year’s theme was “Awaken Summer Imagination.” Our Y wants to ensure all kids awaken their summer imaginations through healthy eating habits and physical activity. Because when a child is happy, healthy, motivated and excited something amazing is inevitably going to result. As children grow and reach their true potential, they can accomplish great things. Healthy Kids Day encourages youth and families to awaken summer imagination andthis cannot be done without proper nutrition. This year, our Healthy Kids Day event included a community art mural, STEM projects, a 30ft inflatable obstacle course, as well as, an obstacle course including basketball and soccer and swim time for parents and children. Over 25 local “healthy” vendors participated, handing out information and fun giveaways! Two local ShopRite’s participated with their Registered Dietitians and promoted healthy snacks and recipes. Wendy’s, who was also a sponsor of the event, show cased healthy menu items for parents and children to choose from when eating out.